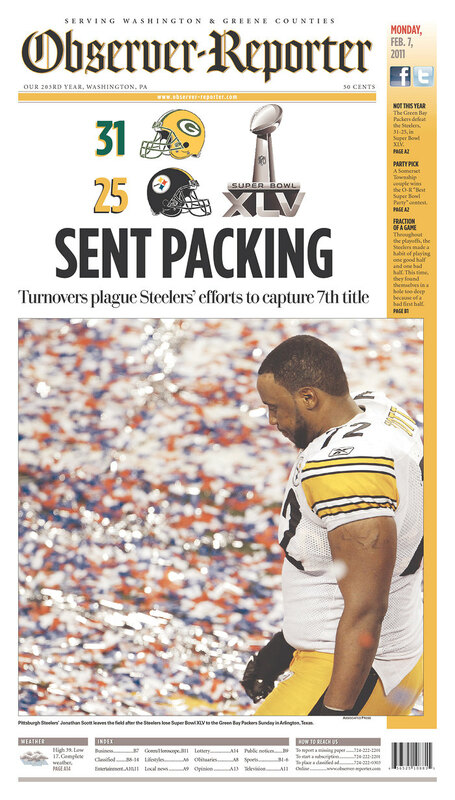 “SENT PACKING” from the Washington (Pa.) News Observer. Newseum had this as their favorite with “7 Can Wait” from the Beaver (Pa.) County Times. Some honorable mentions: “RING FOURTH” from the St. Paul Pioneer Press, “A LOMBARDI LEAP” from the Minneapolis Star Tribune and “GOING GREEN” from the Naples (Fla.) Daily News. My winners: “BIG CHEESY” from Red Eye in Chicago, with what I believe is some rightful bitterness. … “RODGERS THAT” from the Houston Chronicle, with rightful credit going to the game’s best player. The worst in my book were the most generic. “SUPER!” CHAMPS!” have been done four billion times before, and “TOP OF THE PACK” could have been written by anyone — and by too many. 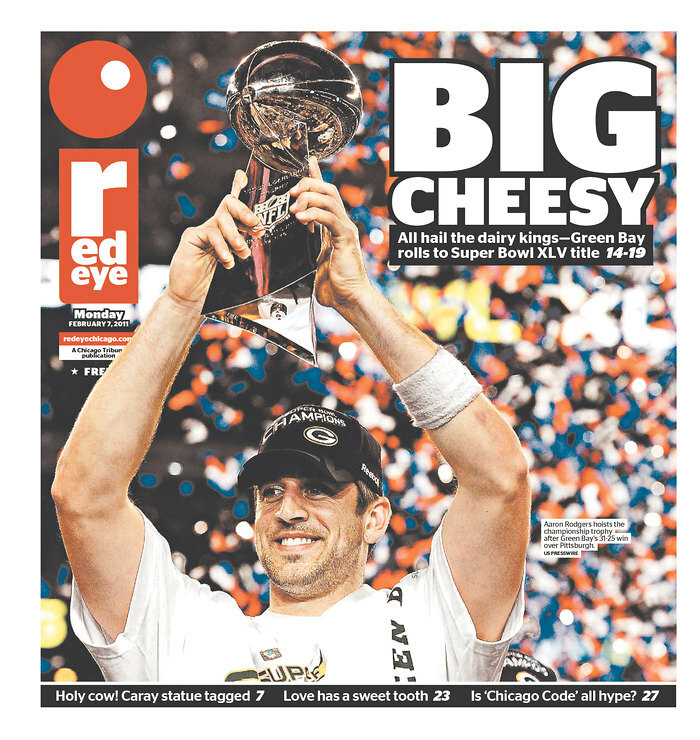 “TITLETOWN AGAIN” from the Milwaukee Journal Sentinel was elegantly simple, but maybe too simple. Their outstanding layout made up for it. The worst for me was “SAY CHEESE.” Besides the fact that it was in about every fifth newspaper, it was a dorkier pick than me writing about this dorky stuff. Unfortunately, my friends at the Duluth News Tribune went with this one. Fortunately, they made up for it with the best layout I saw this side of the Journal Sentinel. This entry was posted in Art and tagged Big Cheesy, Rodgers That, Super Bowl headlines. Bookmark the permalink.